Coach Springer presents these scoring drills used by Manu Ginobili - San Antonio Spurs, NBA All-Star. 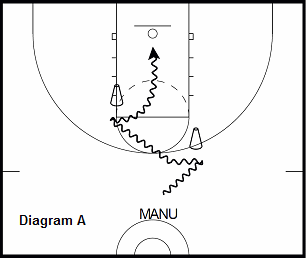 Diagram A. Manu is talented at hitting a crossover but keeping his feet moving while reading the defender. If they go for it he will quickly cross back to the other hand. Drill: Attack the first cone with a crossover. Pause briefly and attack the second cone with another crossover. Make 20 in each direction. Diagram B. 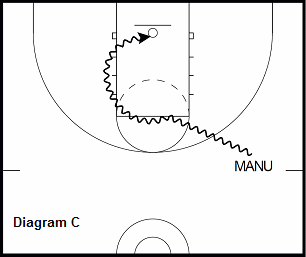 An attack move Manu likes to use is a hesitation move then attack with the dribble. If the defense is playing him hard he well make a quick pull back crossover into his jumpshot. Drill: Start dribble on the wing. Hesitate then drive to the basket. At the cone perform the pullback crossover into a jump shot. Make 30 on each side of the court. 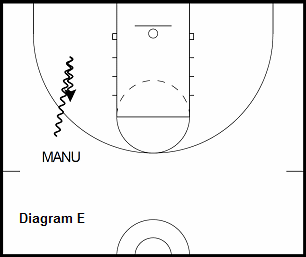 Diagram C. Manu understands that sometimes when he attacks the paint that the defense will collapse, which allows him to redirect to the lane line and create a new lane to the basket. 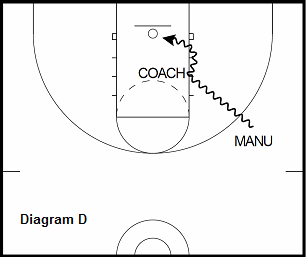 Drill: Attack the nail then quickly redirect towards the lane line into a runner off the glass. Make 20 on each side of the court. 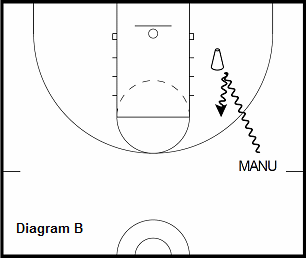 Diagram D. While driving to the basket, Manu will purposely bounce into a defender to gain leverage and then extend into his layup to separate for the score. Drill: Drive to the basket and step into the coach with the pad and bounce out into layup. Make 20 on each side of the court. Diagram E. One of Manus's more popular moves is his behind the back step-back jump shot. He will attack with the drive, quickly shoot the ball behind his back, and separate with a step-back jump shot. Drill: Attack with the dribble and quickly perform the move. Make 20 on each side of the court. 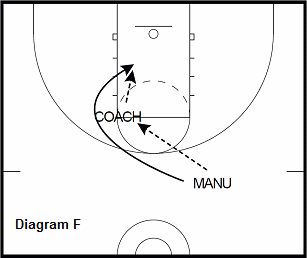 Diagram F. Manu will pass to the high post then curl around for a quick hand off or dump pass into a layup. Drill: Pass to coach and quickly curl around for catch into layup. Make 20 on each side. 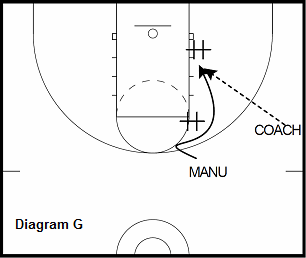 Diagram G. Manu will receive a back-screen. If he can't get the ball on the cut, he will post up his defender on the block. Drill: Fake and cut off the first chair (#). Post up the second chair and score when receiving the ball from the coach. Make 20 shots on both blocks. 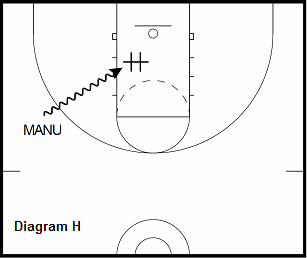 Diagram H. Manu will use the in/out move to freeze the help defender then quickly shoot a floater over the top of them. Drill: Attack the chair (#) with a in/out then quickly shoot a floater over the top of them. Make 20 on each side of the court. Diagram I. 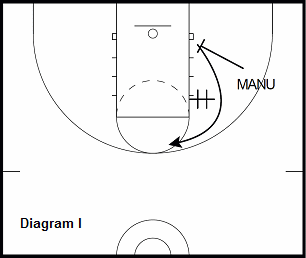 The Spurs run a play where Manu will set a down-screen and then curl into a screen for a catch and shoot jump shot. Drill: Set the down-screen and then curl into the catch and shoot while running off the screen. Make 20 on each side of the court.